Day Two in Madrid, spent in two big museums: the Prado and the Thyssen Bornemisa. 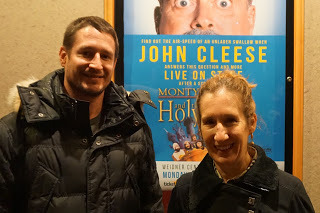 But first, I have to mention that Lynn was stressed out about how we would get to Granada. Lynn is usually quite unflappable, so I figured it must be kind of a big deal but trusted that she would figure it out. I realize that may sound lazy. I have to admit that after all the planning I had done for Italy and Malta, I had kind of zoned out and let Lynn do all the work on Spain. I listened with half an ear while I lounging on my hotel bed, scrolling through Facebook. So I may not have this all exactly right, but apparently getting to Granada would be complicated and a long journey with a higher than preferable chance of getting stuck overnight in a tiny village that might not have any lodgings. “I booked a train, but we have to stop in a small town somewhere, get off and take a bus to an even smaller town, and then take another bus because there’s construction on the line or something,” Lynn said. “I’m sure it’ll be fine,” I responded. This is one of the cons of traveling with someone—you can put all your faith in them, then wake up, too late, in a fleabag motel in a remote dusty village in nowhereseville, Spain. That’s pronounced no-wheres-vee-ya, by the way. “It’ll be an adventure!” I said absently, which was probably annoying. “I’m just going to check flights,” Lynn said. Twenty minutes later we were booked onto a Ryanair or some other cheapo airline flight that would get us to Grenada in half an hour. This had finally got me engaged, since it would cost money. Lynn wouldn’t tell me how much the flights were, beyond “dead cheap.” Then she cancelled the train/bus tickets so she could get her money back, which made me feel better. I had scoped out the Prado online before the trip and had a couple artists in mind that I wanted to check out. Like Francisco Goya—I had seen this painting in one of my Spanish textbooks and wondered what else he had done. 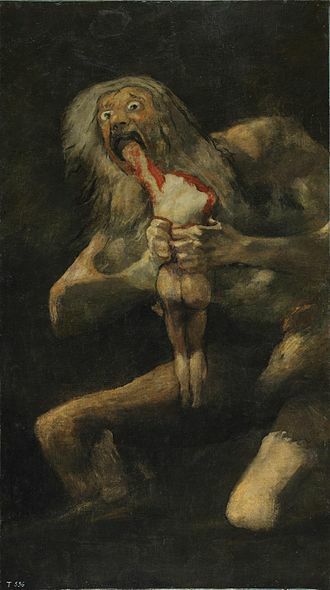 Not surprisingly, most of Goya’s other paintings were dark and creepy too. After all the Madonnas and baby Jesus’s I’d seen so far, I found then refreshing. There was a room of Caravaggios which I slunk through quickly, and three rooms of El Grecos. 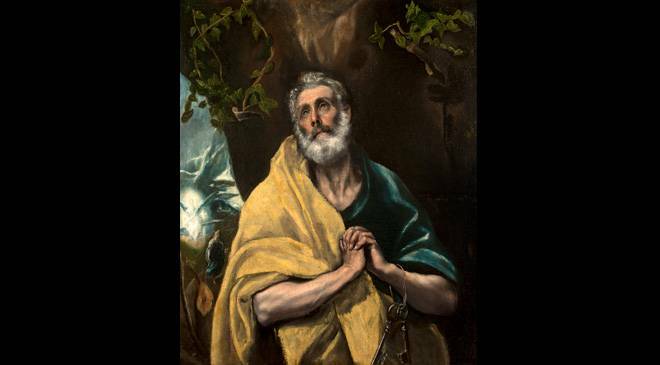 I had heard of El Greco and, maybe because I was raised in a Catholic milieu, seen his painting of St. Peter a million times. It’s not at the Prado, but here it is to give you an idea of his style. I had never realized—duh—that El Greco was his nickname, probably because his real name was Doménikos Theotokópoulos and no one in Italy or Spain, where he lived most of his life, could pronounce it. Doesn’t it remind you of Salvador Dali? 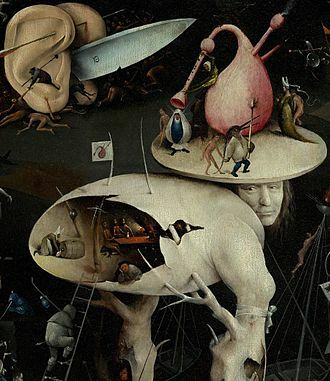 Except that Dali painted in the 20th Century, and Bosch painted this around 1505. Was he taking hallucinogenic drugs? Was he mentally ill? Or was he a very “outside the box” thinker? If so, how is it that some people can do that? 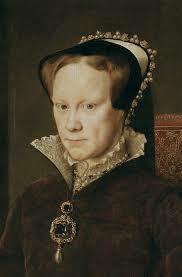 Finally, to satisfy my obsession with all things related to the Tudors, there was this portrait of Queen Mary, Henry the VIII’s daughter, otherwise known as Bloody Mary. 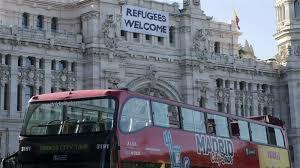 The Thyssen Bornemisa Museum was across a roundabout from the Prado, were this banner was displayed on a government building. I’d love to see more of this in the USA right about now. This entry was posted in Adventure, Budget travel, Culture shock, Travel and tagged Abstract Art, Prado, Refugee Ban, Spain, travel on February 9, 2017 by Breaking Free.